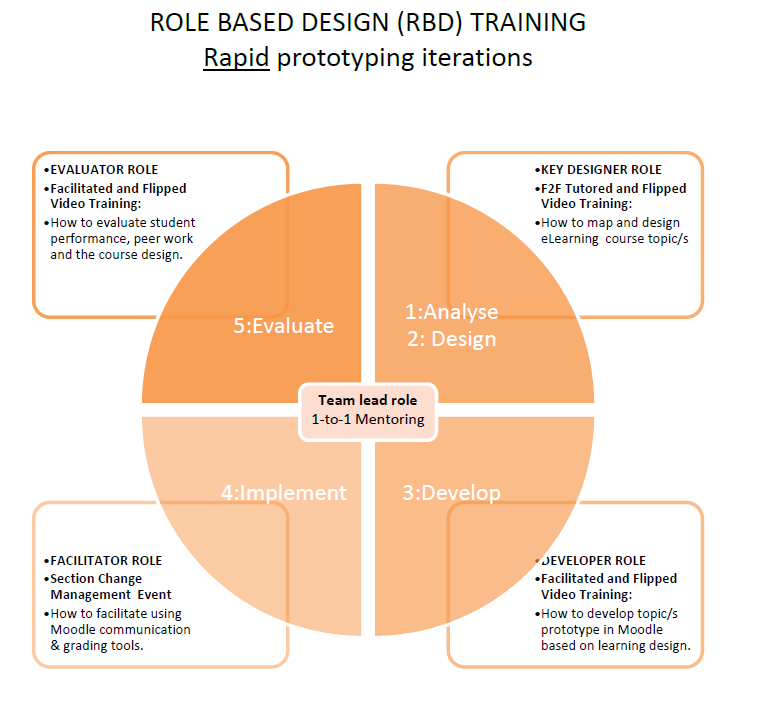 The Role Based Design (RBD) model provides a practical way to build organisational e-Learning design capacity. The model was successfully piloted at South Western Sydney Institute (a Vocational Education organisation) with teaching teams who co-designed a series of e-Learning products in Moodle. The following resources are from my Masters in e-Learnings research on Role Based Design and a presentation I delivered at MoodleMoot 2015. Parker, S. 2014. ‘Role Based Design An evaluation of a ‘schediogogical’ (ski.dio.gogical) approach for developing systemic eLearning capacity by leading and facilitating agile co-design processes’, International Journal of Instructional Technology and Distance Learning, vol. 11, no. 8, pp. 3-28.